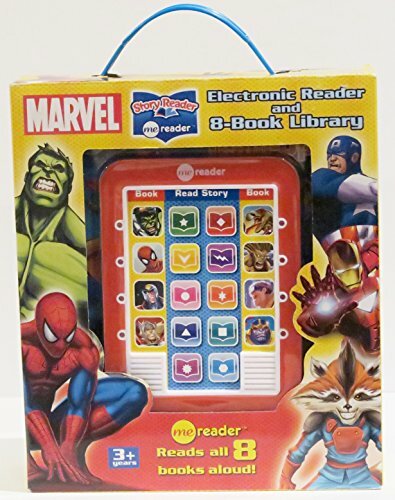 Story Reader Electronic Reader and 8-Book Library is an electronic reading system. The Reader is an electronic pad that reads out loud each of eight storybooks feat. 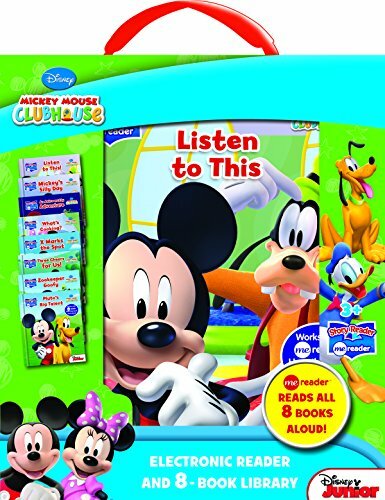 Mickey Mouse Clubhouse illustrations. The Me Reader library features 8 case bound, paper page books with 10 content spreads each, and an 18 button Reader, packaged in a reusable box. Choose your book, press it's matching button on the Reader then press the button that matched the story spread you're on. Hear the story read aloud with rich narration and engaging sounds! The books read great on their own for quiet play too! Includes 3 replaceable AAA batteries. Small parts. Me Reader is a Story Reader Electronic Reading System and 8-Book Library. The Reader is a stand-alone electronic pad that resembles an eReader. Me Readers read out loud each of eight storybooks featuring Winnie The Pooh, Dumbo, Peter Pan, and 101 Dalmatians. Includes 3 replaceable AAA batteries. 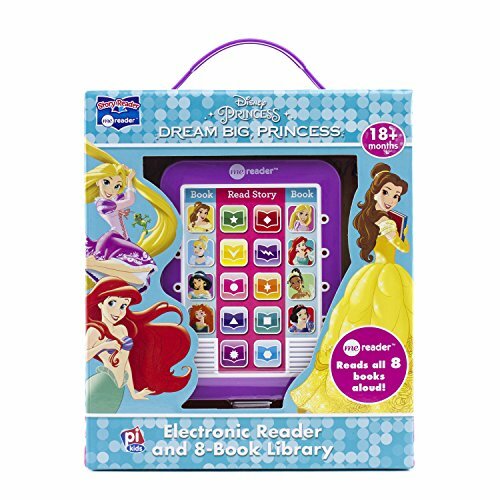 Me Reader Disney Princess: Dream Big Princess. Electronic reading system with a stand-alone electronic pad that resembles an eReader. Press the book ID button followed by color-coded spread buttons to hear text read aloud. Includes 3 replaceable AAA batteries. 8 hardcover books with 24 paper pages each. Join in a wonderful adventure with the Disney Princesses. Includes stories from Ariel, Cinderella, Tiana, Rapunzel, and Belle. 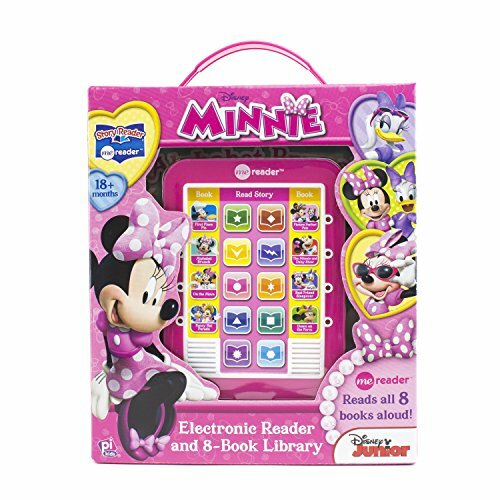 Me Reader Minnie: Story Reader Electronic Reader and 8-Book Library is an electronic reading system. The Reader is an electronic pad that reads out loud each of eight storybooks feat. Minnie Mouse illustrations. Record the book of your choice onto the any book! pen. Requires 2 AAA batteries (not included). Additionally, a set of sound effect stickers for your Childs fun and entertainment are included. Reads all 8 books aloud! Electronic reading system, Stand-alone electronic pad that resembles an eReader. Press the book ID button followed by clolr-coded spread buttons to hear text read aloud. 8 hardcover books with paper pages, 24 pages per book, 18 triggers, 8 LEDs. 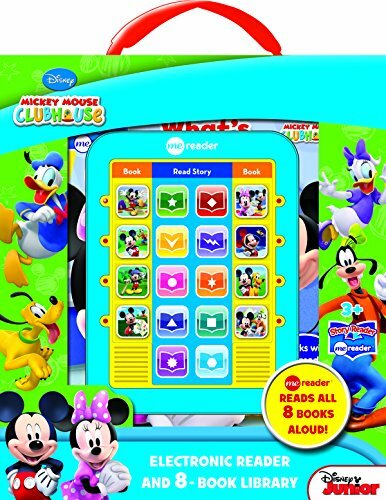 This Mickey Mouse Clubhouse Story Reader Electronic Reader and 8-Book Library is a new electronic reading system from the makers of Story Reader 2.0. 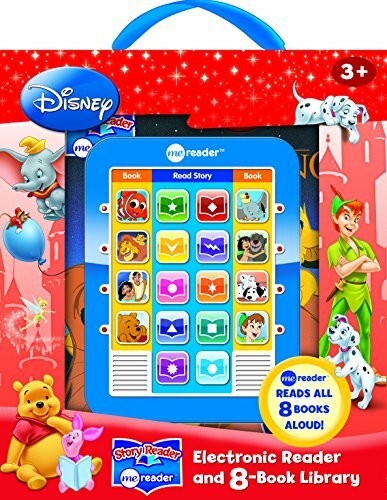 The Reader is a 4.5x6-inch electronic pad that reads out loud each of eight Mickey Mouse Clubhouse storybooks. 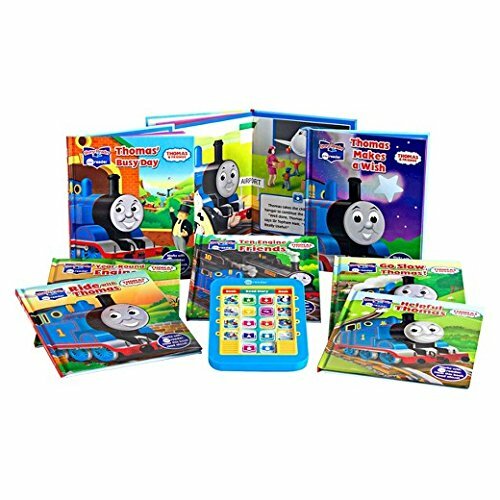 The reading pad is compatible only with the storybooks included in the set. The Reader system is recommended for children ages 3 years and older. The device is simple to work. To begin, children select one of the eight storybook buttons on the Reader, which is made of sturdy hard plastic. Next, they find the storybook they have selected, open to the first page of the story, and press a "Read Story" button on the pad to activate the narrator's voice. Each time they turn a page, children again press a "Read Story" button to continue hearing the story. Kids know which "Read Story" button to press by matching those on the pad with those in the storybook. Story Reader Electronic Reader and 8-Book Library is an electronic reading system. 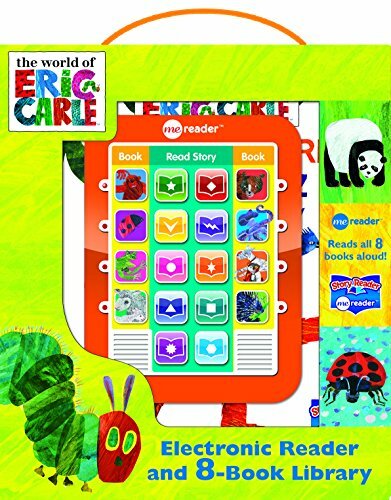 The Reader is an electronic pad that reads out loud each of eight storybooks featuring Eric Carle illustrations. Press a Book ID button to select one of the eight books in the set. Open the book to any spread and press the matching Spread ID button on the module to hear the text on that spread read aloud. Includes Reader and 8 books with 24 paper pages each. Use your Tag Reader to make phonics skills spring to life. The Tag Learn to Read Series combines fun stories with rich audio to help children identify letter sounds and hear how they come together to form words. 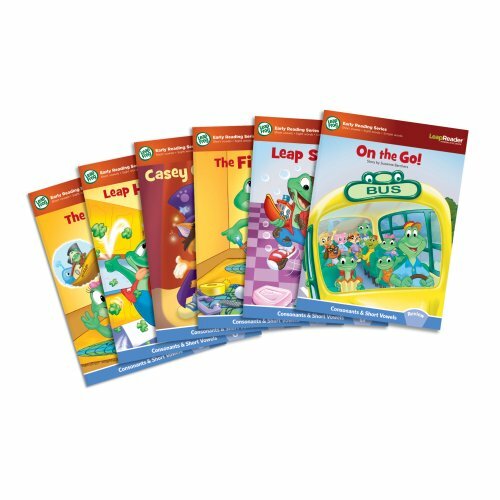 Each six-book set introduces a different series of skills, helping children build confidence with the fundamentals of reading. Compare prices on Electronic Reader Books at ShoppinGent.com – use promo codes and coupons for best offers and deals. Start smart buying with ShoppinGent.com right now and choose your golden price on every purchase.